← Domain knowledge or process skill? Choosing to do an MBA is a big decision for anyone, particularly if, like me, you are 40 with a wife and 3 children. But after the first strategy lecture at Cranfield University I knew I had made the right choice. Here was a subject that was raising all the questions that I’d been grappling with over the last 15 years in the high-tech industry. Just why did some companies fail and others succeed, why did experienced executives make stupid acquisitions for seemingly hormonal reasons, and why would a company choose the try to build a product which its engineers had proven to be impractical? These were all real, concrete, painful experiences from my first 15 years and now finally, I was going to get some answers. By the end of that term, I was seething with frustration as in every Strategy lecture more and more ‘interesting questions’ were raised, and no answers were delivered. We’d do models, frameworks, alternative theories, case studies, you name it. The only thing you couldn’t do was name a few concrete bits of advice that would a difference. I was doubting the sanity of my decision to “do” the MBA. 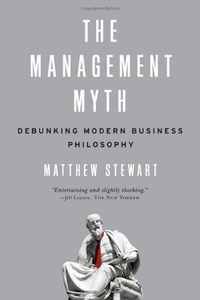 Reading Matthew Stewart’s The Management Myth recently brought all of that back to me, but this time with a smug, wry smile that comes with the realisation that you were right all along. The Management Myth is two stories intertwined. The first is that of Stewart’s progression from Philosophy student to management consultant, the trials and tribulations of being involved in a consultancy management buy-out, being ripped off, lied to, and finally opting for a more settled life as a writer. The second parallel story is that of history of management theory, strategy and those frustrating models and frameworks. With a solid grounding in philosophy, plus an insider’s view of management consultancy, he is uniquely positioned to take apart management theory brick by crumbling brick. Best of all he does so with a storyteller’s skill. It is a joy to read. For those of you who have been force-fed the tablets of strategy as handed down by the gods of management, it is worth lingering on each step of the history as Stewart reveals each of them to be charlatans. Fredrick Winslow Taylor is often described as the father of ‘scientific management’. In one of the first management ‘case studies’ from 1899 he describes the movement of high-carbon iron ‘pig iron’ bars at Bethlehem Steel Company. Taylor also had a talent for telling stories and used it generously. His story centres on how, by using scientific measurement and method, you could improve the efficiency of work and therefore profit. Unfortunately there is “no evidence that Bethlehem Steel realised any significant benefit from the experience” and two years later they ceased all Taylor’s programs. In true management consultancy style, having offered nothing of value he walked away with $100,000 ($2.5m in today’s money) in fees. Two of his junior collaborators later described his story as “absolutely nothing but fiction”, and “one of the worst distortions of a story told by Mr Taylor I have ever come across”. The conclusions Taylor reaches mostly boil down to tautologies. His work is dismissed as not science and poor management. Next up for the Stewart treatment is Elton Mayo. Apparently Mayo had a talent for conversation and extemporaneous speaking. That and fantasy. He liked to style himself as ‘Dr Mayo’ and had a letter from the Prime Minister of Queensland describing him as a “Professor of Psychology and Physiology”. He was none of the above, apart from a fantasist that is. You may not have heard of Mayo, but you may well have heard of the ‘Hawthorne Effect’. A series of experiments, conducted by Holmer Hibarger, had been in progress at Western Electric, in their Relay Assembly area at the Hawthorne Works. Focussed on whether production could be improved by increased lighting levels, they were, unsurprisingly, funded by the electricity companies. In 1928 Mayo was invited to help understand the results. The understanding of the ‘effect’ today is that subjects improve or modify an aspect of their behaviour simply in response to the fact that they are being studied. The story is far more complex and many other factors came into play (replacement of ‘slackers’, changes in number of types of relays, experience, noise, etc). In Mayo’s interpretation the subjects improved productivity because “they felt themselves to be participating freely and without afterthought, and were happy in the knowledge that they were working without coercion from above or limitation from below”. That is as opposed to the fact they were offered financial incentives, which is what the participants said this was the reason for their improved performance. Mayo’s interpretation stood for 2 decades, enough time for it to become part of management ‘accepted wisdom’. When independent researchers finally looked at the original evidence they described his work as ‘worthless scientifically’ and ‘scientifically illiterate’. For many Peter Ducker is the father of modern strategic thought. Sadly for his reputation, in 1954 he wrote “the reports of [Elton Mayo and his associates] on the work at Hawthorne are still the best, the most advanced and the most complete work on the subject [of human relations]”. Mayo’s ideas were not even new; British Industrialist Robert Owen discovered the effect and implemented ideas into his textile mill in Manchester a century before, even the ancient Greeks recognised that free citizens were more productive. Michael Porter was to continue the honourable tradition of ‘pompous maxims’ in his, very, very long book on Competitive Strategy. He offers three generic strategies (following Bain’s barriers to entry) of ‘cost leadership’, ‘differentiated offerings’, and ‘focus on a market niche’. For Porter’s theories to work they require a comprehensive theory of the world, or at least an industry sector, not something any businessman I have met has ever had. I’d tell you about his ‘five forces’, but they are yet more ‘generic reminders’. Boston Consulting Group’s portfolio matrix is quickly summarised as “preposterous”. Hamel and Prahalad’s attempted to support their ideas by studying a range of firms which they deemed successful. Bill Gates commented in 1998 that “every example they gave, with the exception of Hewlett-Packard, was a total joke.” They developed Porter’s ‘Resource-based view’ into their theory of ‘core competencies’, which Stewart points out, is an epistemological quagmire, basically boiling down to companies being good because they are good at being good. 6 million copies of Tom Peters, “we faked the data”, and Robert Waterman’s In Search of Excellence, attempt to establish what ‘excellent’ companies have in common. The same method as Jim Collins in Good to Great, Napolean Hill in Think and Grow Rich, Stephen Covey in The Seven Habits of…. No control group, no experiment, no repeatable process; no science. A basic confusion between correlation and causation – how can we tell that these observed qualities are not the result of being excellent rather than its cause? Anyone with just a passing experience of business will tell you that this is pretty well useless, as the past can look after itself; we have to engage with the future. And, in engaging with our competitors we face another paradox. If these theories have any relevance, then we should all follow them. If everyone follows the same theories, and everyone has the same information, then everyone will make the same decisions. That will lead to a commoditisation of their output and profits will disappear. In such a world (a fantasy world of the gods of strategy) the only way to win is to do the opposite. Hoorah, my inclination for perversity finally finds a theoretical basis. Stewart learnt everything he needed to know in order to become a hugely well-paid consultant in a ‘three week mini-MBA’ provided by his consulting firm. By the end of my MBA year I was so annoyed with strategy that I parodied the professor in an end of year skit with my team. I, as Captain James T. Kirk of the Enterprise, communicated with the Klingon leader (editing together video snippets from said Professor’s pompous lectures). I challenged him to answer my question, he prevaricated, I demanded a “yes” or “no” answer, he swerved onto another topic, so finally I order the crew to fire the photon torpedoes and blew him to smithereens to the cheers of the assembled MBA students. Childish, but very gratifying. To my shame I own a copy of every one of the books mentioned above. I’m thinking of a ‘Bonfire of the Vanities’. This entry was posted in book review and tagged Book review, decision making, futurology, MBA, strategy, theory. Bookmark the permalink.